The following are unsolicited comments from our readers. To respect their privacy, we have omitted their names. 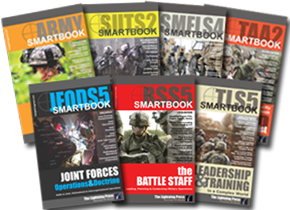 “I bought a copy of The Leader’s SMARTBook while attending PLDC at Fort Dix, NJ. Boy did you hit the nail on the head with this one! Everything I needed or that was referenced as far as NCO leadership is concerned I was able to find in your book! I really think you folks need to contact the Sergeant’s Major Academy at Fort Sam Houston and get them to use your SMARTBook for all their NCOES courses. Keep up the great work. You are providing a great service to our soldiers.